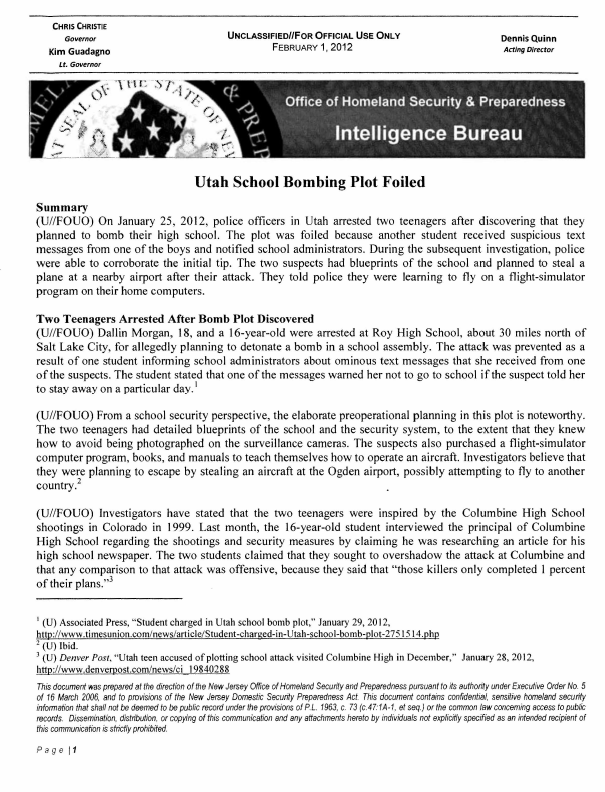 (U//FOUO) On January 25, 2012, police officers in Utah arrested two teenagers after discovering that they planned to bomb their high school. The plot was foiled because another student received suspicious text messages from one of the boys and notified school administrators. During the subsequent investigation, police were able to corroborate the initial tip. The two suspects had blueprints of the school and planned to steal a plane at a nearby airport after their attack. They told police they were learning to fly on a flight-simulator program on their home computers. (U//FOUO) Dallin Morgan, 18, and a 16-year-old were arrested at Roy High School, about 30 miles north of Salt Lake City, for allegedly planning to detonate a bomb in a school assembly. The attack was prevented as a result of one student informing school administrators about ominous text messages that she received from one of the suspects. The student stated that one of the messages warned her not to go to school if the suspect told her to stay away on a particular day. (U//FOUO) From a school security perspective, the elaborate preoperational planning in this plot is noteworthy. The two teenagers had detailed blueprints of the school and the security system, to the extent that they knew how to avoid being photographed on the surveillance cameras. The suspects also purchased a flight-simulator computer program, books, and manuals to teach themselves how to operate an aircraft. Investigators believe that they were planning to escape by stealing an aircraft at the Ogden airport, possibly attempting to fly to another country. (U//FOUO) This incident was averted after one student realized the seriousness of the threat by these two suspects. It demonstrates the importance of encouraging students, teachers, school resource officers, and school administrators to report suspicious activity. It also provides a current case study for New Jersey law enforcement and school administrators regarding preparations and other activities that can lead up to an attack at a school.